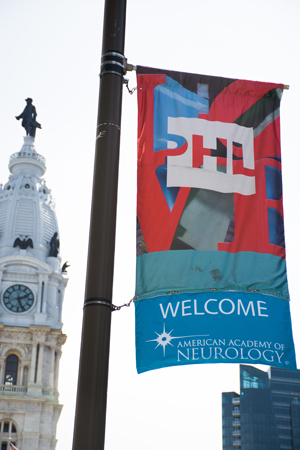 The 2014 Annual Meeting of the American Academy of Neurology (AAN) attracted more than 13,000 neurology professionals to Philadelphia, a city rich in its own neurology-related history. More than 2,500 presentations of cutting-edge research were available to attendees from across the world. The number of non-U.S. attendees was nearly 4,000. Science and continuing medical education are the main draws to the Annual Meeting, and this year was no exception. One of the highlights was the Presidential Plenary Session, the AAN’s premier lecture awards for clinically relevant research. James L. Bernat, MD, FAAN, gave the Presidential Lecture on “Challenges to Ethics and Professionalism Facing the Contemporary Neurologist.” The George C. Cotzias Lecture featured Stefan M. Pulst, MD, FAAN, speaking on “Degenerative Ataxias: From Genes to Therapies.” The Sidney Carter Award in Child Neurology went to Darryl C. De Vivo, MD, FAAN, who expounded on “Rare Diseases and Neurological Phenotypes.” Finally, David M. Holtzman, MD, FAAN, shared “Alzheimer’s Disease in 2014: Mapping a Road Forward,” as the Robert Wartenberg lecturer. The Hot Topics Plenary Session presented recent research findings and clinical implications regarding identification of a unique molecular and functional microglia signature in health and disease; emerging concepts in chronic traumatic encephalopathy; functional connectivity and functional imaging in movement disorders; and the global epidemic in stroke. Abstracts related to new therapeutic developments, clinical applications of basic and translational research, and innovative technical developments were shared and discussed at the Contemporary Clinical Issues Plenary Session. This year’s topics were acute ischemic stroke, Friedreich’s ataxia, insomnia, epilepsy, functional (psychogenic) disorders and the Parkinson’s disease Progression Marker Initiative. At the Frontiers in Translational Neuroscience Plenary Session, attendees heard about the clinical aspects of tissue environments for brain repair; opportunities and challenges of robot-assisted and facilitated neurorecovery; network-based neurodegeneration; using fixed circuits to generate flexible behaviors; advances in the Human Connectome Project; and the nightlife of astrocytes. The Clinical Trials Plenary Session addressed important topics that affect patient care identified from submitted abstracts that had recently been presented at other society meetings, including stroke, MS, migraine, intracranial hypertension and glioblastoma. The week concluded with the Neurology Year in Review Plenary Session, which examined advances in MS, headache/pain, neuromuscular diseases, movement disorders, neurocritical care and Alzheimer’s disease. More science was available at numerous platform sessions, seven poster sessions and a new, fast-paced series of Poster Blitz presentations. Another new feature at this year’s meeting was an International Lounge, which provided an opportunity for foreign guests to mingle, network with leading neurologists from the U.S. and other countries, and relax before the next session. A significant portion of the meeting was devoted to helping U.S. neurologists understand the many changes initiated by Congress and federal regulatory agencies as part of health care reform. Neurologists, like other physicians, are under tremendous pressure to reduce treatment costs without compromising the quality of care. The AAN works hard to guide members through these issues using a variety of resources and tools, while advocating on their behalf with members of Congress and administration officials in Washington, DC. U.S. Senator Bob Casey (D-PA) spoke with neurologists concerned about cuts to federal health programs for the elderly and the economically disadvantaged. Another Pennsylvania legislator, Congressman Chaka Fattah of the U.S. House of Representatives, spoke at the Brain Health Fair about his initiative to support brain research. This fair is a free public event presented by the American Brain Foundation. The fair typically draws 1,000 to 2,000 people from the region who are living with brain disease or caring for a family member or friend. They hear about new research and treatments from neurologists, health organizations and the medical industry. 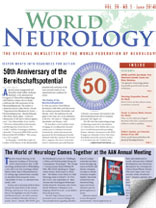 Media from across the globe gathered to provide powerful coverage of neurology’s largest meeting. Reporters and photographers shared the latest news in brain research with their readers and listeners back home. The AAN pressroom was lively with representatives from major national and international news outlets and neurology trade publications. AAN President Timothy A. Pedley, MD, FAAN, remarked on the strong media interest in the meeting. Plans are already under way for the 2015 Annual Meeting, to be held April 18-25 in Washington, DC. Until then, the AAN will continue to connect neurologists with the best in science and education through several gatherings, including The Sports Concussion Conference in July; the AAN Fall Conference in October; and Breakthroughs in Neurology 2014: Translating Today’s Discoveries into Tomorrow’s Clinic, to be held in December. As always, the world is invited.